The first 60 interviews from USC Shoah Foundation’s Armenian Genocide Collection are now safely in the hands of the Armenian Genocide Museum & Institute. 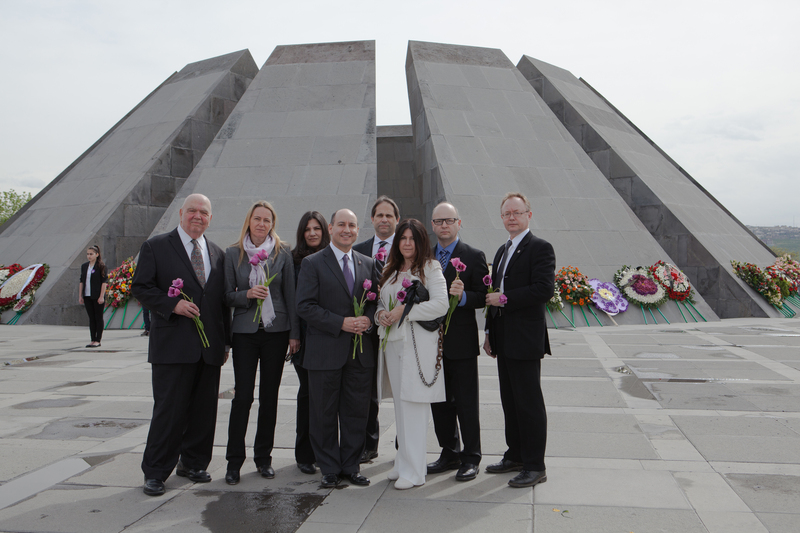 A delegation from USC Shoah Foundation is in Yerevan, Armenia, this week to commemorate the Armenian Genocide Centennial: Executive Director Stephen Smith, Director of the Center for Advanced Genocide Research Wolf Gruner, Director of Research and Documentation Karen Jungblut, Director of Administration Ari Zev, Professor Richard Hovannisian, and Michael Amerian, trustee of the George Ignatius Foundation which is supporting the trip. On Tuesday, April 21, Smith presented a hard drive inside a film can to Hayk Demoyan, director of the Armenian Genocide Museum & Institute (AGMI). The can belonged to J. Michael Hagopian, the documentary filmmaker who recorded the nearly 400 interviews with Armenian Genocide survivors and witnesses from the 1970s-2000s that are now in the possession of USC Shoah Foundation. 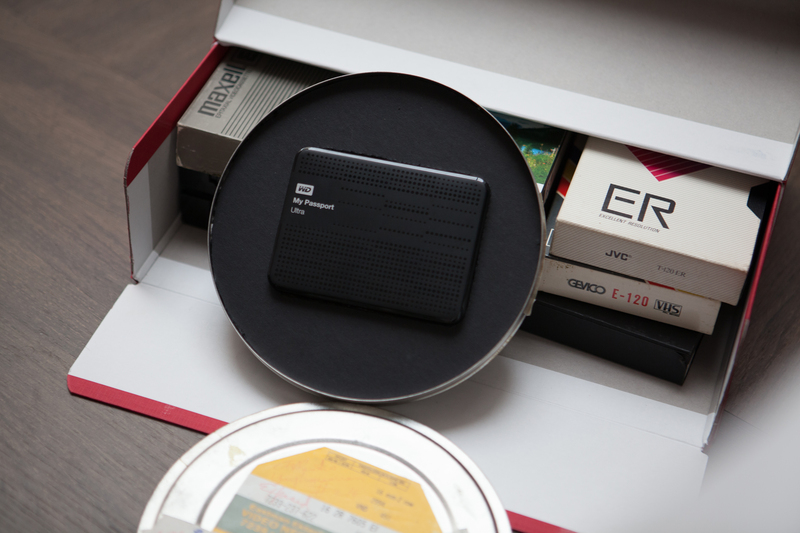 The hard drive contained the first 60 of those interviews to be indexed, subtitled and integrated into the Visual History Archive. Demoyan and Smith recently signed a memorandum of understanding in a reception at USC that paves the way for future collaboration between the two organizations. The agreement promises to make AGMI a full access site of the Visual History Archive, so visitors and scholars in Yerevan can view all 52,000 testimonies, including the Holocaust, Rwandan Genocide and Armenian Genocide collections, on-site at the museum. AGMI will also collaborate on research and educational projects with USC Shoah Foundation and explore the possibility of expanding the Armenian Genocide Collection with new or existing testimony. 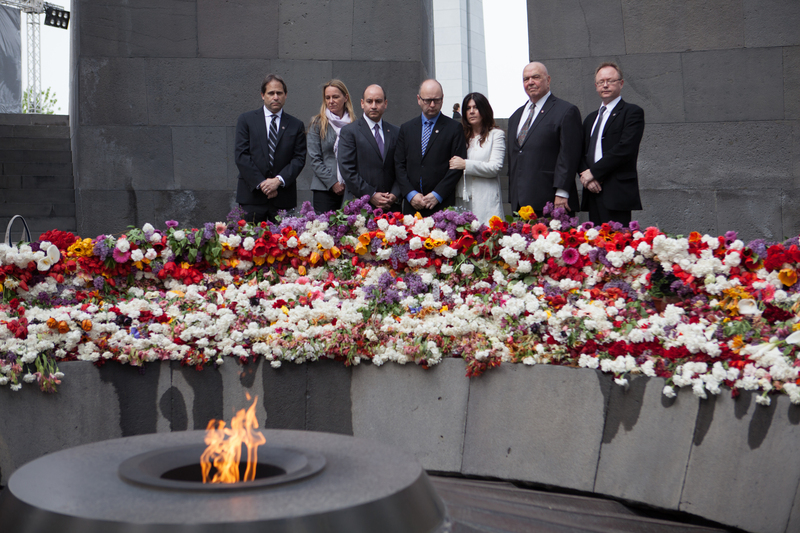 While in Yerevan, the delegation is also visiting museums and memorial sites, meeting with potential partners and participating in the official genocide commemoration on Friday. The commemoration will be attended by leaders from around the world, many of whom are officially recognizing the Armenian Genocide for the first time, including Austria and Germany.